Today, the Buffalo Nickel, Silver and Gold Coins tell the story of the first minting of the new design 102 years ago. Indian Head and Buffalo Designs Striking Features. Washington — Coinage of the new nickel was ordered by Secretary MacVeagh today. It will be place in circulation in the course of a week. The protests against the new coin dwindled to one manufacturer who claimed it would interfere with the efficacy of his machine for the detection of counterfeit nickels. Treasury officials held this was not controlling on the government, and the new five-cent piece, with an Indian head on the face and a buffalo on the reverse, was adopted officially. Over the next few weeks as the new coins began arriving in change, some people liked the new design while others did not. New Coin Fails to Get Approval of Local Citizens. The new nickel has appeared in Gettysburg and the opinion here seems to be that it is a miserable failure from an artistic point of view. It has a ponderous-looking buffalo on one side and an Indian head on the other side. The buffalo is so big that it crowds everything else off the coin, while the Indian fills in the circle like a big photograph in a small frame. The lettering on the coin is very poorly done and people generally seem to prefer the five-cent piece which has been in use for so many years. First New Nickel Reaches Milwaukeean; Design More Attractive Than The Old. The first of the new “Buffalo” nickels to have arrived in Milwaukee came to Godfrey Augustyn, National Exchange bank, and member of the school board, Monday morning , from a friend in Chicago. On one side of the coin is an Indian head, with the word Liberty above and 1913 below. On the other side is a Buffalo with the words United States of America above and 5 cents below. A federal law permits changing of coins only once in twenty-five year and the government proposes to make about $4,000,000 worth of the nickels this year. Now, years later, the American Buffalo design may not be considered the most beautiful coin ever struck by the US Mint, however the design is certainly one of the most respected. As such, in 2001, the US Mint produced the American Buffalo Commemorative Silver Dollar Coins using the same design. 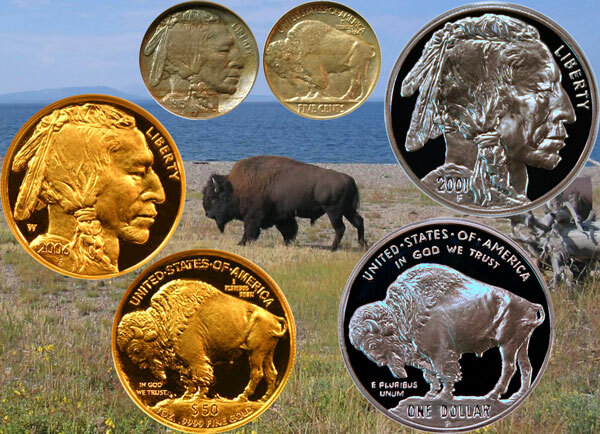 Next, beginning in 2008, the US Mint’s gold bullion program began including James Earle Fraser’s design of the Indian head and American Buffalo on four denominations of gold coins: $5 – one-tenth ounce, $10 – one-quarter ounce, $25 – one-half ounce and $50 – one ounce. The Buffalo Nickel, Silver and Gold Coins show against a background of an American buffalo on a western prairie.